Figure below shows the base and post operation of the 3 main AHUs in the building. 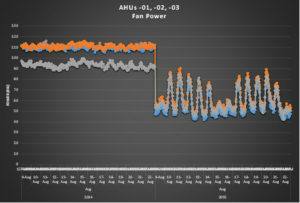 Prior to the modifications, all 3 AHU supply fans were pegged at 100% speed, the air change per hour (ACH) rates were over 15 in many labs and the building initially had an energy intensity of 366 kBTU/sq. ft./yr. As a result of using Analytika, the supply and exhaust ducts were balanced and an unoccupied schedule was corrected. Cimetrics and facility personnel worked with Environmental Health and Safety (EH&S) to reduce ACH rates to 6/3 during occupied and unoccupied hours, and there was a reduction in static pressure setpoint. The existing building energy intensity has been reduced to 327 kBTU/sq. ft./yr. and additional AHU capacity is now available. Annual carbon emissions reduction: 2,230 metric tons. Contact us to learn how Analytika can help you. Next Next post: A hospital saves over a million dollars in annual energy costs while improving comfort, sustainability, and social responsibility in the community.